Find My Workspace lists over 95% of the business centres market in Glasgow. Simply click Request Quote to check pricing for one office, or Add to Basket for multiple offices. The building offers fully equipped office space, access to meeting rooms, a welcoming reception team and state-of-the-art IT technology. For a limited time only, one car parking space is inclusive of monthly rental and one month lease free is being offered with 12-month contracts. 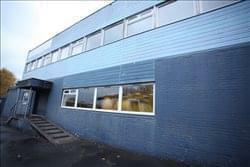 This workspace is a modern building, suitable for small and large businesses is located in the centre of Glasgow. Amenities include 24-hour access, fully equipped kitchen, showers. There is no private parking however its location means there are plenty of car parks around the centre. 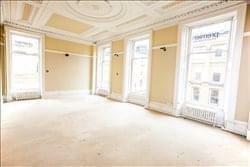 The spacious first floor property comprises three main rooms totalling approx. 1,100 sq. ft. 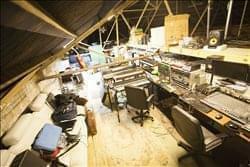 The second floor and basement is also available if more space is required. This stunningly designed building provides a unique, professional and relaxed environment to make you feel inspired, encouraged and motivated throughout the day. Take advantage of the dynamic, modern, fully stocked meeting rooms which are perfect if you’ve invited clients for the day. Enjoy the free tea, coffee, fresh fruit and snacks to keep you fuelled, with an onsite bar to help you unwind, relax and network in your out of office activities. There is also plenty of breakout spaces, where you can meet with co-workers and brainstorm your latest ideas. The offices are fully furnished, with an onsite reception team to ensure all your queries are dealt with. There is also 24-hour security, ensuring your safety on site. With central heating and full air conditioning, the space is ideal to work all year round and is perfect for any business looking to grow and expand. Recently refurbished to a high specification, modern serviced offices in an iconic building in one of the best addresses in Glasgow. 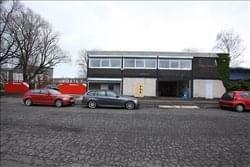 Suitable for businesses of any size looking for a prime address. High quality furnishings and finishing in a professional facility, which is easily accessible for clients and their customers. Excellent meeting facilities and IT capabilities in a very central location. No VAT on licence. Shower rooms and kitchen facilities. Meeting Rooms available. Super-fast broadband included. This ground floor workspace is located in a great location of Glasgow, situated near the Southside which is secure and easy to find. Amenities include; 24 hour access 7 days a week, a separate kitchen and washroom facilities, free on street parking, close to local road links. You will also be able to decorate your space as you please. This workspace is located in a great area of Glasgow, the space is secure and easy to find. The offices are clean and have a number of windows, giving you a great deal of natural light. You will have 24/7 access to the centre and there is free street parking nearby. In your office you will also have access to a separate kitchen and washroom facilities, lighting will also be included in the rent. Glasgow City is only a fifteen-mintue drive away. Finally this space gives you easy access to motorways for travel and is also local bus routes. These offices are ideal for small or new start businesses, and hold with them the option to move to a bigger office, if required. Finished to the highest standard and within a high quality building, the office space will provide your business with a fantastic working environment, and present your business as the professional operation it is. There are offices available from only £250.00 including VAT per month. The office price includes high Speed Broadband/WIFI, security Controlled Entrance and 24/7 access to the building. There are also male and female toilets on same floor and kitchen facilities (including microwave). The offices are centrally located in the heart of Glasgow, and benefit from a G1 postcode, allowing them to rank higher on Google etc. 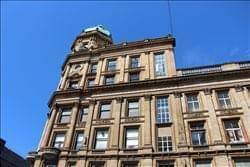 The building is a short walking distance from the two main Glasgow train stations, has an underground Subway station directly outside, and has easy access to bus and motorway links. Street parking, as well as three multi-storey car parks, are available for all day parking for a price of £4.00. 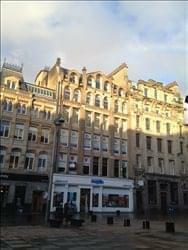 There are also many cafes, stores, and high street banks located directly next to us within St Enoch Square. This provides you with the base for which your business to grow upon, and there is no need to move location as you can upgrade to a bigger office (or smaller if required). Our offices are located within a Business Centre, so please bear in mind that this is a professional building, and is therefore suitable for professional businesses with a quiet working environment. The offices shown in the pictures are all of different sizes and prices so it is sure this centre can suit your specific needs. There may well be cheaper offices available elsewhere, but with this Business Centre, you pay for a quality working environment, and will not be disappointed. The facility offers a full range of office, business and storage services. Tenants will also have access to kitchen and conferencing facilities as well as the added luxury of being directly connected to a bespoke constructed self-storage operator offering the best value storage in the area. Your monthly rental figure includes rent, rates and electricity as well as allocated private parking spaces. The terms offered are also extremely flexible, all we ask for is one-month notice from the tenant. Set in a stunning listed building and blessed with one of the best connected locations in Glasgow, this centre offers a chance to be part of an energetic, productive coworking community. With an ultra-flexible membership basis on offer, any type of business can seamlessly transition into this centre without the potential worry of tying themselves down to a long-term contract. Whether you are a new startup looking to put down your first roots as a business, or looking for a beautiful, ready-to-go place to work whilst in the city for a short time, this centre’s adaptable can offer something for any situation. The centre benefits from plenty of natural light to produce an environment that energises its tenants to achieve their goals, and comes packed full of useful amenities to make you feel comfortable. With access to bookable meeting rooms and a business address, this centre is a great place to base your brand. Boasting ultrafast WiFi, scanning/printing facilities, kitchen access – with locally produced beverages on offer – and use of all communal areas, tenants with feel at home immediately. This centre located a stone throw away from Glasgow City Centre will give you everything you need to run a successful business. With access 24/7 and bills included in the monthly rent with this property. 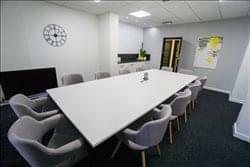 As well as 24/7 access and bills included you will also have access to a kitchen/washroom, customer waiting rooms, meeting rooms and you are able to decorate and fit out your office as you please. There are plenty nearby amenities such cafes, supermarkets, local shops and fast food restaurants. There is also free on street parking. 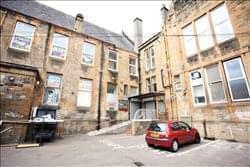 This workspace located just outside the centre of Glasgow is available immediately. The newly refurbished first floor office will give you 24-hour access to the space and the widows in the office give you copious amounts of natural light to work comfortably. Glasgow City Centre is only a fourteen-minute drive away and the space is also situated on local bus routes so travel will not be a problem. This business centre offers a variety of flexible spaces to suit any evolving business. There are dedicated private offices of different sizes are available for those who want to work privately or there are dedicated desks in the middle of the hub which allows businesses to enjoy the buzz of working amongst like-minded, talented people. For those on the go and travel with work a lot, there are hot desks available in the lounge which offer an ideal landing space. You can pitch, meet, launch, network, host or dial-in using our conferencing facilities and meeting rooms, bookable by the hour, that are tailored to be as flexible as you need. We have rooms accommodating from four up to 60 people. Great work starts with great space and many comforts. Downstairs, you’ll find bike storage, showers and secure lockers. Upstairs, you’ll find kitchens, breakout areas, lounges and private phone booths. All areas are connected by superior WiFi. A dedicated café area is yours to rest and recharge in, morning, noon and evening. Or, head outside to the private, decked terrace, a space to pause and enjoy some fresh air. These contemporary private offices and shared work spaces offer flexible membership plans and are a great fit for a wide variety of businesses. To obtain information for your selected Glasgow City County Business Centres, please tick the "Add to basket" box for each office you prefer and complete the form below. We will then send a detailed report via email.